When I made the Superhero Shoes for Rex, I mentioned that I really wanted to test out the heat transfer vinyl on a shirt. I wanted to make sure it worked well before talking about it. 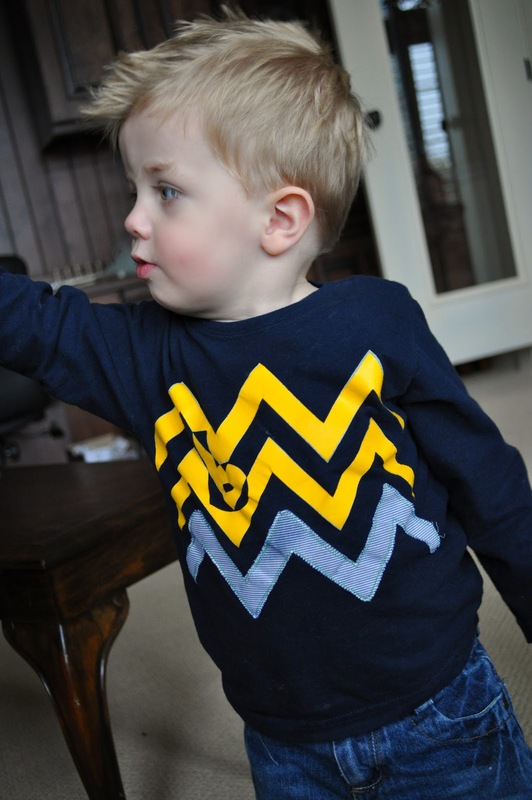 Well, I made this little chevron shirt for Baden a couple of weeks ago. I've washed it a few times and I am really happy with how the heat transfer vinyl held up. AND, I am excited to show you how I used it without the Silhouette machine. The vinyl has a clear film layer on it that stays on it until you're done ironing your design on it. Why does that matter? Because I could draw all I wanted on that layer to help me get the design right and then I peeled it off when the shirt was done. Let me show you what I mean. I made sure I had the clear layer on top and started drawing out my chevron (or zigzag) design. I wanted to measure it to make it accurate. I made all the marks I wanted and then drew a "b" on top of it. See? The heat transfer vinyl can be found HERE. It's $14.99 for a roll of it, but you could make a ton of stuff with one roll, as it's 3 feet long. That's all for today. Thank you for reading my blog. Now that's something I might be able to do without scrapping my project 10 times. Bade looks so cute in it. His face is so squishy loveable. Love the Chevron Stripes (I just learned the name of these on Friday!!!). Thanks for sharing. I love that pattern on a little boy shirt. I never would have thought of that! You're one creative lady! That's great! I just got a silhouette recently on one of those promos where you get heat transfer vinyl with it. I really need to give it a try! Your blog always makes me want to create things for my little man. cute! I will try to make one for my son :) Thanks for sharing! So fun! And thank YOU for blogging!! !